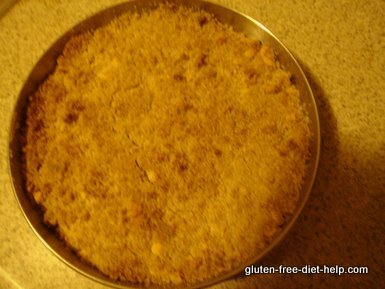 This gluten free coffee cake recipe is fast and easy to make. It is one of the most tempting of gluten free sweets, the rich scent emanating from the oven as it is baking will bring everyone to the kitchen for this treat. This recipe can be made with milk or a milk substitute. It is likely to become one of your favorite gluten and dairy free recipes. Start with the flour mix below or use your own favorite mix. Put these into a small bowl or a bag and blend thoroughly. You can use your own flour mix if you wish, but this mix is really good. Mix dry ingredients well. Be sure all ingredients are evenly blended. Leave this mix now and make the crumb topping. Before baking you will add milk and oil, but just immediately before. In a small bowl, add cinnamon and sugar to flour mix and blend well. Add the butter or margarine, and work into the flour by hand until the flour resembles pea size lumps. Add the bread crumbs and work in until they are coated. Grease an 8 or 9 inch cake pan. Turn on the oven to 425F degrees to preheat. Return to first bowl and add the oil and the milk. Stir in until the dry ingredients are just all wet. Mixture should be thick but workable. You can add a little more milk if needed to make it into a paste consistency. Avoid overworking the dough, as this should be tender. Turn dough into the cake pan and pat into place. Let the dough rest in a warm place to rise for 15 minutes. If you turn off the oven and place it inside it will rise well. After dough has risen, sprinkle topping onto dough and return to the oven. Bake at 425 degrees for 25 minutes. Allow to cool at least 10 minutes. If topping begins to get too dark, turn oven down to 400 degrees for the remainder of the baking time. I hope you will enjoy this gluten free coffee cake.